Healthcare Stalemate: Could It Be a Flashpoint for Renewal? Like many of you, I watched with sadness the recent defeat of the Obamacare repeal and replace bill in the United States Senate. I was grieved, mad, disgusted, and yet hopeful that something good may still come out of this momentous failure. I’ve previously criticized the Democratic Party for its secular tendencies and lack of concern for the common person. Now it’s time to be equally disgusted with the gutless and hypocritical Republicans (at least some of them). But, are we really looking in a mirror at the failures of America’s most prestigious club (US Senate)? And could the healthcare stalemate produce a flashpoint for renewal in America? I think it’s important to analyze ALL the players in the healthcare fight. It’s not true that everybody failed in this endeavor, just like it’s wrong to conclude that everyone in America is equally responsible for our cultural decline. But we all play a part–all 327 million of us–whether America prospers in righteousness or withers through chaos in the 21st century. Here is my take on all the participants and what needs to do done. I will list the groups and individuals that I consider the least guilty to the greatest culprits (in that order). I will also suggest what each of them (us) should do. The Freedom Caucus members of the House of Representatives and a number of Republican senators (Ted Cruz, Mike Lee etc.) cannot be blamed for the Obamacare repeal defeat. Mark Meadows, Jim Jordan and others did their part in the People’s Chamber, and Senator Cruz offered a strong amendment in the Senate that should have repealed and replaced one of America’s worst pieces of legislation. Senator Lindsay Graham recently offered another good idea–block grant monies to the states to let each of them design the health care system best able to meet their peoples’ needs. So, kudos to the good guys who are trying to reform the government. We mustn’t lump them in with the cowards and scoundrels. Pray that their ideas and influence would rise in Congress. For the most part, our 45th president also can’t be blamed for the collapsing Obamacare nightmare. He campaigned strongly against it and did everything in his power to support repeal and replace. Now he is threatening to put Congress under it by executive order. You might remember that our legislators exempted themselves from Obamacare through sleight-of-hand–pretending to be “small business owners” rather than self-serving and well paid politicians. However, good leaders never put themselves above their followers. In fact, the job of a leader is to serve their constituents by sacrificing more than is required by the group. President Trump should remove their exemption and put some pain in their decision-making bones. Might get them to see the light. Forty-nine of fifty-two Republican senators voted for at least a “skinny” repeal of Obamacare that would have opened the door for House/Senate conference changes. A few of them (Senators Portman, Capito, and Heller) waffled on full repeal, but closed ranks at the end. The Republican Party is often stupid politically, is not used to leading “from the front,” and has lost much of its backbone in defense of liberty, free markets, and moral freedom. They must again find their identity in vibrant biblical faith and our proven Constitution. But, most of them are not the main problem. Rinos refer to “Republican in Name Only” and this label fits the two women who torpedoed the ACA rescue. Senator Murkowski clearly ran on repeal and replace, then betrayed her constituents and the entire nation. She should primaried and replaced in 2020. Susan Collins is at least a consistent liberal who should switch to the Democrat Party. Her strong ties to Planned Parenthood make her an enemy of children and faith. She shouldn’t be excused for being progressive. Her no vote doomed millions of Americans to poor health care, an imploding system, and higher costs. She should also be retired in 2022. 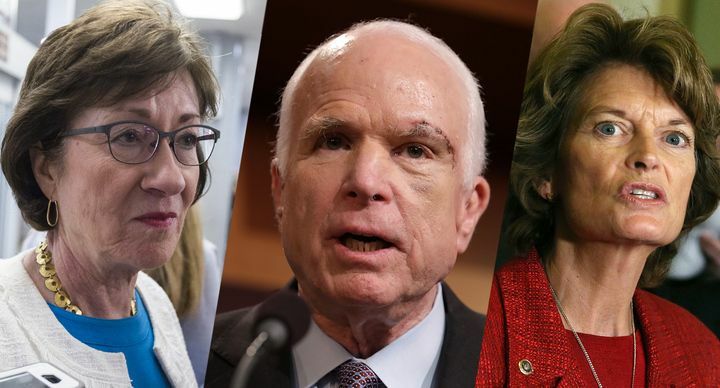 There are other RINOS in the Senate and House who no longer share a passion for faith, family, freedom, and national strength. The Republican Party should start raising up strong candidates to run against them in 2018, 2020 and 2022–pursuing a long range vision for governmental transformation. We need sixty principled Senators to turn-around America. Will you pray for them to be raised up? Didn’t we already mention him? Or are there two Donald Trumps in Washington, D.C.? Yes, at times. I’m greatly supportive of President Trump’s work ethic and most policy positions. They may be stronger than any president of my lifetime. Many of his outstanding Cabinet members participate in a weekly Bible study (a first in possibly 100 years). But his destructive tweets and childish personality get him in trouble. So how’s he to blame? He foolishly criticized John McCain’s military service during the 2016 campaign (he didn’t like soldiers who got “captured”). This statement was rude, stupid, and childish. It came back to haunt him. And who struck the final blow, retaining Obamacare? A bitter John McCain who didn’t forgive Donald Trump. So for President Trump, you reap what you sow. I believe Donald Trump should learn “The Art of the Humble” by inviting John McCain to lunch at the White House to ask his forgiveness for his insensitive campaign remarks. I respect John McCain greatly for his war heroism and service. I also feel sorry for his recent diagnosis of an aggressive brain cancer and pray for healing and God’s peace in his life. But he hurt millions of people by voting no on repeal and replacing Obamacare. There’s no excuse for his arrogance. A man’s early heroic exploits don’t put him beyond criticism. You can begin life as a hero and end it like a cad. John McCain should invite Donald Trump to lunch on Capitol Hill and apologize for paralyzing the Republican Party and making them fools through his about-face no vote. God will bless his humility also. The main earthly culprits for the disaster known as Obamacare are Barack Obama, Harry Reid, Nancy Pelosi, Chuck Schumer, and other Dems who forced this terrible outcome on the American people seven years ago. Either clear-eyed or unwittingly, these leaders tried to change the United States from faith-and-freedom based to government controlled via healthcare. Don’t forget that 48 Democrats voted against repeal and replace. They also exempted themselves from the suffering of the American people. In the name of compassion, they created more government dependency, higher costs, growing debt, and chaos in the health care industry. Some Republicans may be stupid and bitter, but many Democrats are working against the American Revolution that gloriously elevated faith, freedom, limited government, and God-given human rights to world prominence 240 years ago. The Democrats remain the greater villains–and many need to be replaced by the voters. This may not involve you completely, but “we” elected the 48 Democrats. “We” voted for RINO Republicans. “We” are addicted to entitlements. “We” want the government to provide for us. Most of us are not active in civic affairs but largely spend our time entertaining ourselves. Half of us don’t even vote. So, to blame the Democrats or the Republicans solely for the healthcare stalemate is a refusal to acknowledge that millions of Americans are also actively or passively hurting the country. Where do you stand in that regard? What do you need to change to be a part of a great American renewal? I honestly believe that God holds the people of faith (the Church) responsible for most of our encroaching darkness. We’ve failed to multiply our faith. We haven’t reached out to the needy among us. We’ve replaced God with pleasure and failed to be light and salt as our illustrious ancestors did. National repentance by God’s people and a tsunami of prayer are needed at this hour to wash away our disobedience and bring the blessing of God back to America–including the Washington, D.C. swamp. It’s time to open the flood-gates of prayer. The battle for the future of the United States is a spiritual one that involves principalities and powers unseen to the human eye. We must cast them out through spiritual warfare and renew the foundations of our nation by the power of the Holy Spirit. Demonic powers remain our truest enemies. Don’t forget that important perspective. We must win in the heavenlies to see changes on earth. Yes, we’ve arrived at a healthcare stalemate. But winning this battle could tip the scales toward an important American renewal. So, let’s not just blame. Let’s up our game (especially in prayer).